The work week is always hectic for me…get home from work, work on blog tasks, and somehow find time to make a quick and tasty dinner. I recently discovered a secret weapon to save time in the kitchen – without sacrificing flavor in the process. New Skillet Sauces from McCormick provide all of the zesty seasonings and spices you want in a handy pouch! They come in a wide range of flavors – whether you’re craving Mexican, Asian, Itlalian…or even good ‘ol American comfort classics like sloppy joes or BBQ! You simply add the protein of your choice and a few veggies…and dinner’s ready in about 30 minutes! 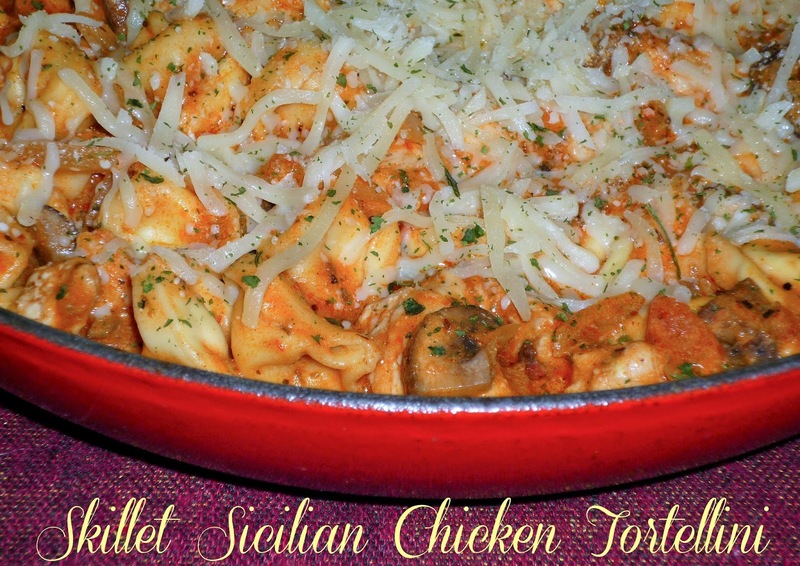 For today’s #WeekdaySupper, I’m sharing my flavorful Skillet Sicilian Chicken Tortellini, made with the Sicilian Chicken with Tomato, Bail & Garlic Skillet Sauce. This hearty skillet dinner is ready in just about 30 minutes, making it ideal for even the busiest of busy weeknights! 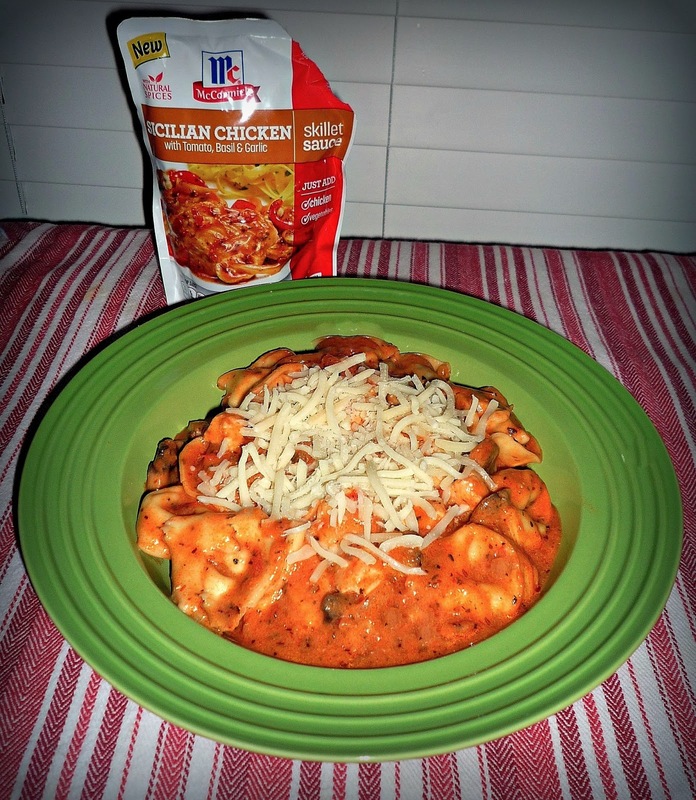 This all-in-one meal features mushrooms, onions, cheese tortellini, and chicken breast in a creamy tomato sauce. 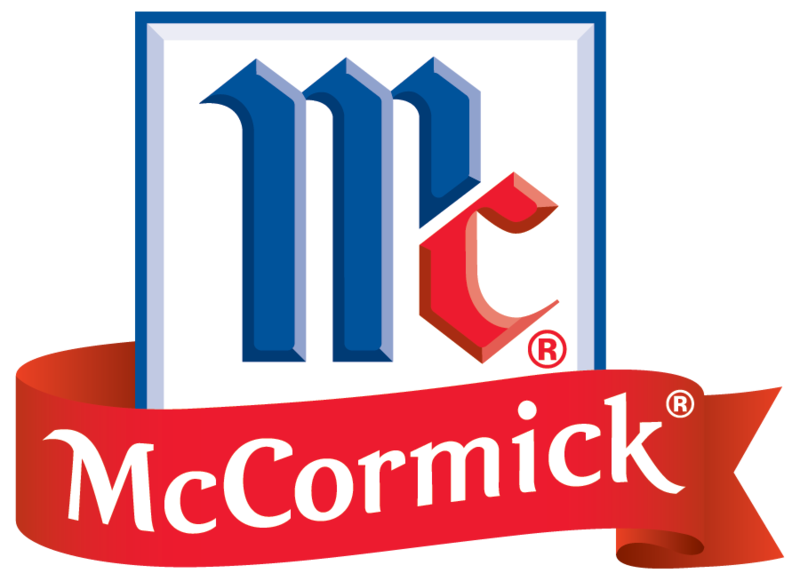 The flavorful sauce is perfectly seasoned by the McCormick Skillet Sauce. Its robust Italian flavors and spices pair perfectly with the veggies, tortellini, and chicken. Some shredded mozzarella blend added just before serving adds an extra layer of flavor too. Who doesn't love melted cheese?!?!? All you need to add is a simple salad and maybe some garlic bread to complete this simple weeknight skillet dinner! Step 1: Bring a pot of salted water to boil to cook the tortellini. While you wait for the water to boil, make the rest of the dish. Add the olive oil to a large skillet over med-high heat. 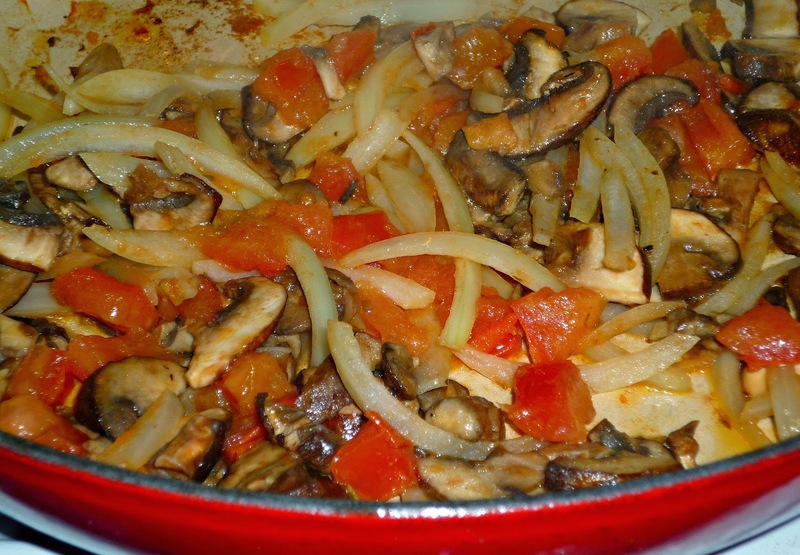 When the oil is hot, add the onion, mushrooms, and tomato. Cook for 2-3 minutes, stirring occasionally, until the veggies being to soften. Add the chicken and let sear on both sides. Step 2: Reduce heat to medium and add the McCormick Skillet Sauce to the veggie-chicken mixture. Stir to combine and simmer for 1-2 minutes. Add the half and half and stir to combine. Reduce heat to med-low and simmer for 5 minutes. By this time, your tortellini should be ready to cook. Step 3: Cook tortellini according to package directions; drain and add to the mixture in the skillet. Add salt & pepper to taste and stir well to combine. Remove from heat and evenly sprinkle the shredded Italian cheese on top. Just before serving, sprinkle with the parsley and garnish with basil leaves if desired. Serve directly from the skillet. This dish is a perfect meal – only one dish is dirtied, and the flavor is amazing! 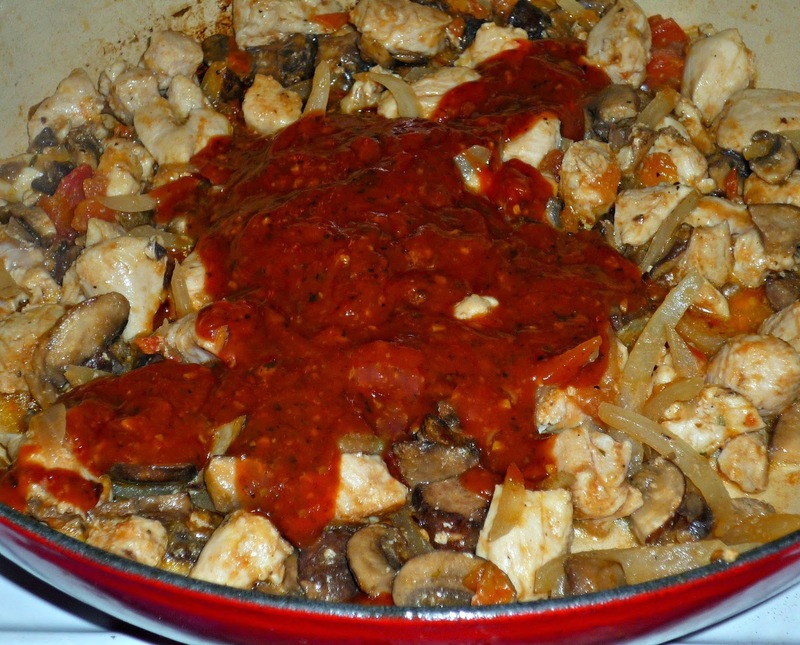 The Sicilian Chicken with Tomato, Basil & Garlic Skillet Sauce features robust flavors, and the half and half provides a silky texture. 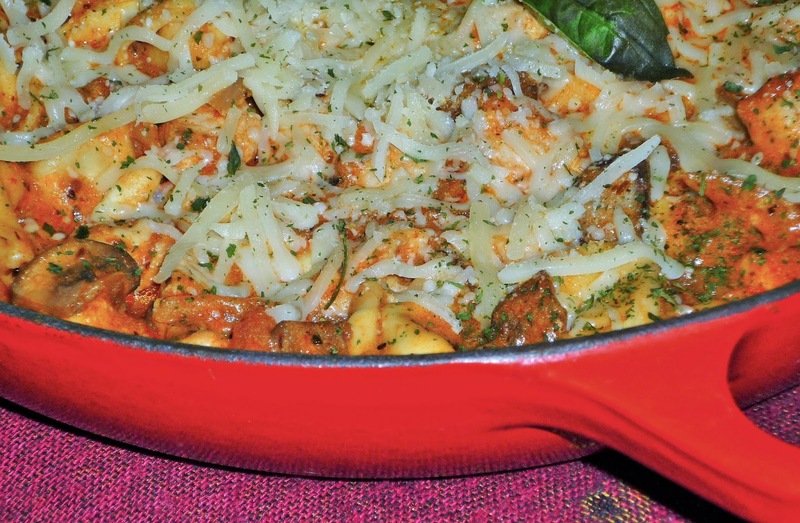 We absolutely loved the combination of cheese tortellini and chicken, along with the meaty cremini mushrooms. This is a filling and flavorful dinner – and melted cheese on top is an extra decadent touch! I can’t wait to make this dish again, because it’s so easy to whip up -- but it tastes like I spent hours in the kitchen preparing it. This week’s #WeekdaySupper participants are sharing some mouthwatering dinner recipes using McCormick’s new Skillet Sauces…so be sure to check them out and add them to your dinner rotation!